Turns out they do. But it also turns out it doesn’t work. Interfering with a crocodile trap is bad for multiple reasons, Miles noted, among them the “unacceptable waste of taxpayer-funded crocodile management resources” if a trap is damaged. A damaged trap might also injure a crocodile, he said, and the delay needed to get a new trap means an effort to “remove a problem crocodile” may take longer than necessary. Also, he pointed out, “[t]hese traps are specifically designed to attract crocodiles and they are deployed in places where a problem crocodile is known to be present.” Ergo, he seemed to be suggesting, one should not linger in the vicinity of such a trap if one would like to avoid ending up as crocodile poop. I assumed “problem crocodile” was a euphemism for “crocodile that has eaten somebody or probably will,” and it is, but it’s also a statutory term. Under the Nature Conservation (Estuarine Crocodile) Conservation Plan 2007, a crocodile is a “problem” if it “is, or is likely to become, a danger to humans,” or has bypassed a “crocodile prevention barrier” and gotten into an area where it might be a threat to fish, livestock or dogs. 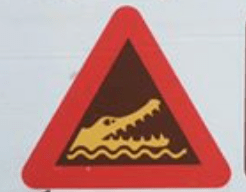 I guess that’s more or less the same thing, though: if there’s a crocodile around, that’s a problem. So, if this happens, a qualified person—it says the “holder of a crocodile management authority,” so I’m going to call them “crocodile managers”—a crocodile manager will come out and try to catch the problem crocodile in an approved way. One of those ways is to set a large trap in the problem area, and like most traps, these are baited with things that the animal in question would like to eat. Again, as a reminder, these traps are set in places “where a problem crocodile is known to be present,” and they are, in fact, “specifically designed to attract crocodiles” to them. This is why it’s a bad idea to get inside one with the bait. Yes. That is correct. 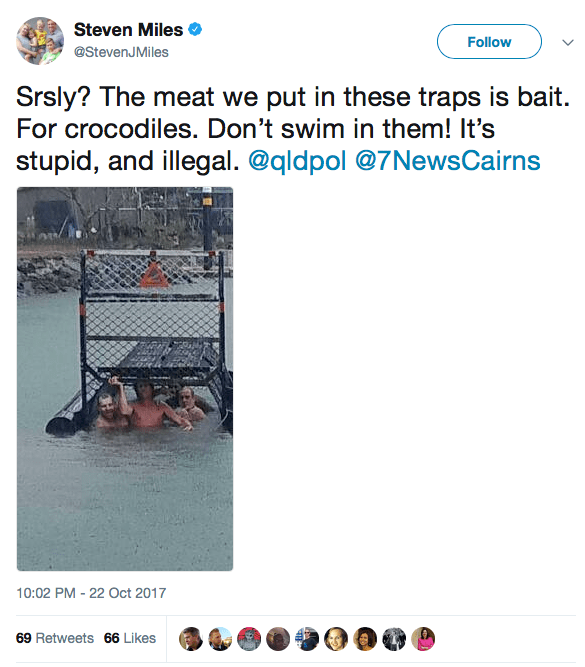 On Sunday, Australian sources reported that the government had launched an investigation after seeing this and other photos posted to Facebook, showing a group of blokes interfering with a crocodile trap at the Port Douglas Marina. One of the photos shows a man standing on the trap, another shows one man inside the trap with the door closed while another clings to the trap, and two of the photos show all four men fully inside the trap as one holds the door open so they can easily be joined in there by the problem crocodile if he shows up. damaging, destroying, defacing or modifying a sign attached to the trap. Speaking of signs, one of the signs attached to this trap looked like this (left), so the men could not have been unclear as to what the floating structure was for. Although that’s probably giving them too much credit. Maybe they thought the sign meant “crocodile shipping container,” and reasoned that because no crocodile was inside at the time, the croc must have been unloaded and taken to its final destination, making the empty crocodile shipping container now perfectly safe to get inside of. That is, frankly, the least stupid rationale I can come up with. (Emphasis added again.) There were even more such statements in this report on Monday, which also quoted Miles as well as the local mayor, Julie Leu. “That’s exactly where you might find a crocodile,” Leu said, “because that’s where the bait is.” She continued, “These fellows are vying for the idiots-of-the-century award,” which is surely true, although in this particular century I can’t see them being in the top ten. Miles similarly noted, “It appears they’ve swum under a sign that says it’s illegal to tamper with this trap and put themselves literally where we put the bait.” He clearly still had not recovered from the gobsmacking this stupidity gave him over the weekend. Asked about the law, Miles pointed out that it’s not illegal to be in the water near a trap, only to interfere with one. But it is super-dumb. “You can’t make everything that’s stupid illegal,” he said. No, you can’t. Nor, obviously, would it do much good to try.